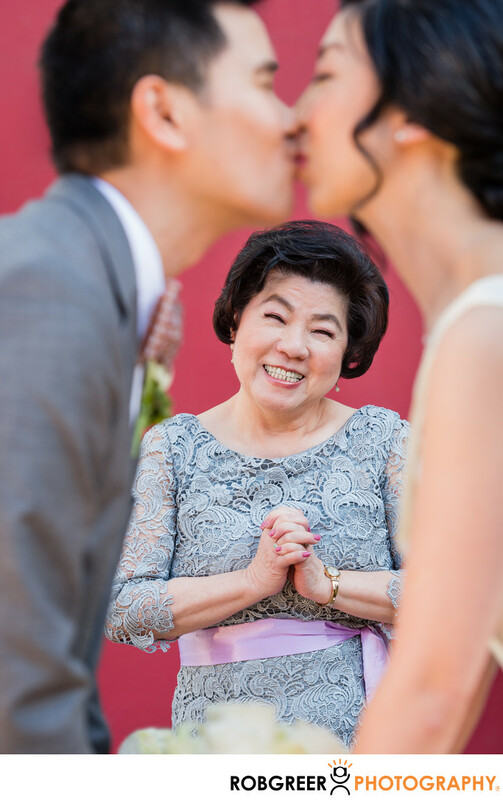 This photograph, titled "Joyful Joy," is one of my favorite photographs from this wedding at Huron Substation in Los Angeles. I received a Gold Award with a score of 90 in the 2014 Wedding and Portrait Photographers International (WPPI) 16x20 Print, Album, and Filmmaking Annual Competition and photographed at Huron Substation near downtown Los Angeles. It was entered in the Bridal Party / Family & Friends category. I was incredibly happy about my score due to the extremely high level of difficulty related to winning a Gold Award. This photograph also received a Junebug Weddings Best of the Best 2013 Honorable Mention under Hilarious Wedding Photos. When I was photographing the bride and groom at this Huron Substation wedding in Los Angeles, the bride's mother was hovering nearby as I was capturing photographs of the happy couple. To put a point on my wedding story, she was running around with her point and shoot digital camera taking photos of as I posed the bride and groom. Rather than spoil her fun by asking her to stop, I decided to bring her into the experience and incorporate her into several photographs. Although that isn't my natural reaction in this kind of situation, I'm so glad that I took that chance. This image was my favorite of the series. Huron Substation is located in Los Angeles, California. Phone: (323) 225-8909. Website: http://www.huronsubstation.com. 1/160; f/5.0; ISO 400; 135.0 mm.